The 3D concert movie One Direction: This Is Us failed to get even close to the $20 million mark at the North American box office this Labor Day weekend (Fri-Sun) despite relatively strong opening-day grosses. Featuring One Direction band members Zayn Malik, Niall Horan, Harry Styles, Liam Payne, and Louis Tomlinson, and directed by Morgan Spurlock, whose Super Size Me was shortlisted for the 2004 Best Documentary Feature Academy Award, One Direction: This Is Us debuted at 2,735 locations, pulling in a not inconsiderable $8.9 million on Thursday evening / Friday, August 29–30, '13, which should have meant approximately $20 million by Sunday evening – especially taking into account that Monday is a national holiday. But it was not meant to be. Whereas Justin Bieber: Never Say Never debuted with $13.1 million at 3,105 sites on opening day in February 2011, eventually collecting $29.51 million over the weekend, One Direction: This Is Us' U.S. and Canada weekend gross is expected to top only $17 million according to studio estimates found at Boxofficemojo.com. But why? A 54.4 percent Friday-to-Saturday drop-off rate helps to explain why. Talk about a movie being frontloaded. Clearly, those who wanted to watch Zayn Malik, Niall Horan, Harry Styles, Liam Payne, and Louis Tomlinson strut their stuff bought tickets for midnight and/or first-day showings. In fact, as Box Office Mojo's Ray Subers explains, One Direction: This Is Us suffered the steepest Friday-to-Saturday drop of any movie (since at least the early '80s) outside of December. For comparison's sake: Justin Bieber: Never Say Never was down only 13 percent on Saturday, while back in February 2008 Hannah Montana & Miley Cyrus: Best of Both Worlds Concert Tour was actually up 51 percent. The way things are going, One Direction: This Is Us should end up raking in only $19-$20 million by the end of Labor Day, one of the times of year Americans and Canadians are too busy stuffing their faces and getting drunk to find time (or energy or sobriety) to go watch movies. Of course, that figure is not bad when you consider the One Direction movie's reported $10 million budget (and somewhat modest marketing campaign), but it's downright disappointing if one takes into account the movie's Thursday/Friday figures and its 3D surcharges. Note: One Direction: This Is Us also grossed a modest $14.5 million from 53 international territories. 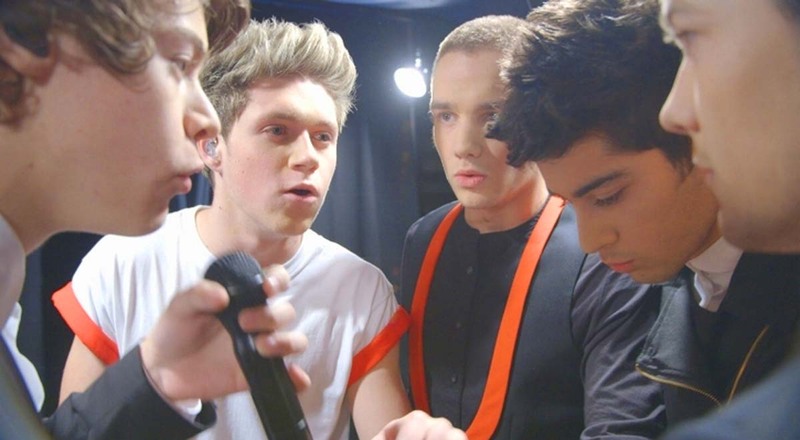 The 3D One Direction movie's worldwide total currently stands at an estimated $31.5 million. The biggest three-day opening in the 3D concert genre belongs to Hannah Montana & Miley Cyrus: Best of Both Worlds Concert Tour, which earned $31.11 million from 683 locations in February 2008. Next is Justin Bieber: Never Say Never with the aforementioned $29.51 million and Michael Jackson's This Is It, which opened on a Wednesday, with $23.23 million in early November 2009. Needless to say, One Direction: This Is Us is lagging behind these titles. The good news: at least the One Direction movie is well ahead of Jonas Brothers: The 3D Concert Experience's $12.51 million from 1,271 theaters in February 2009, and Katy Perry: Part of Me's terrible $7.13 million from 2,730 sites in July 2012. Besides One Direction-ers Zayn Malik, Niall Horan, Liam Payne, Louis Tomlinson, and Harry Styles, One Direction: This Is Us features Dan Richards, Sandy Beales, John Shone, and Josh Devine. The One Direction movie currently has a 59 percent approval rating and 5.7/10 average among Rotten Tomatoes' top critics. Six of the twelve movies that suffered the steepest Friday-to-Saturday drop-off rates have been December releases. Blame that on Christmas Day celebrations, as all six movies opened on December 24. Also of note, three are Twilight Saga movies. Blame that on Twihards who simply had to see their idols on the Twilight movies' first day out – whereas most other moviegoers weren't all that interested in what Bella, Edward, Jacob, and the gang were up to. Also, keep in mind that the Twilight Saga movies had huge midnight grosses that inflated Friday figures. Harry Styles, Niall Horan, Liam Payne, Zayn Malik, and Louis Tomlinson in One Direction: This Is Us movie photo: Tri-Star / Sony Pictures. Movie tickets for One Direction: This Is Us have been a hot commodity among female adolescents, as the 3D concert documentary is set to top the North American box office this Labor Day Weekend. Directed by Morgan Spurlock, whose stomach-conscious Super Size Me (2004) was nominated for an Academy Award in the Best Documentary Feature category, One Direction: This Is Us chronicles the behind-the-scenes and onstage happenings during the world tour of One Direction band members Niall Horan, Zayn Malik, Liam Payne, Harry Styles, and Louis Tomlinson. Currently playing at 2,735 locations, the reportedly $10 million-budgeted One Direction: This Is Us collected $8.9 million on Thursday evening (an estimated $2.7 million) and all day Friday, August 29-30, 2013, according to studio estimates found at Boxofficemojo.com. For comparison's sake: Michael Jackson's This Is It debuted with $7.44 million from 3,481 venues on a Wednesday in late October 2009, while Justin Bieber: Never Say Never debuted with $13.1 million at 3,105 sites on a Friday in February 2011. I should add that One Direction: This Is Us will undoubtedly open well ahead of Jonas Brothers: The 3D Concert Experience's disappointing $12.51 million from 1,271 locations in February 2009, and Katy Perry: Part of Me's dismal $7.13 million from 2,730 venues in July 2012. Besides the aforementioned Niall Horan, Zayn Malik, Liam Payne, Harry Styles, and Louis Tomlinson, One Direction: This Is Us features John Shone, Dan Richards, Sandy Beales, and Josh Devine. Cinematography by Neil Harvey. Niall Horan, Zayn Malik, Liam Payne, Harry Styles, and Louis Tomlinson in One Direction: This Is Us movie photo: Tri-Star / Sony Pictures. Twilight may have had steep drop offs, however, you need to note that all of those films made from a 1/2 billion up to over $600 mil at the worldwide box office. Therefore, drop off be damned. Those Twilight films made a hell of a lot of money unlike the titles on this list except for Deathly Hallows which made over a billion worldwide. So there may have been drop offs, but you need to also note which films were successful and which ones were not. So what the drop off was 40 some odd percent. Making over a 1/2 billion dollars isn't anything to sneeze at and the films on this list can't say that except for the one I mentioned. The fans saw Bella and Edward but just not the very next day.